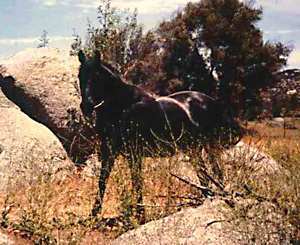 The horse that Clint Eastwood rode in Rawhide was, at the time, a well known cast horse ridden by many, many stars. As he outgrew the cast horse placement he was used as a leader for 4-up and 6-up hitches with the stage coaches, etc. I had been around him a great deal. One day I worked as a wrangler, after my retirement in the stunt business, and used him as a pick-up horse on the Apple Dumpling Gang. I fell even more in love with him. I talked to the stock contractor about buying him and they wanted $40,000 dollars for him as he was such a versatile horse and made them so much money. I said if they ever retired him I would like to have him. One day they called me and said he was broke down (sore) and they were going to send him to the killers. I came apart! I could not understand why, being he had made them so much money they didn’t retire him on one of their cattle ranches near Brawly, California. They informed me it was not economically feasible to do so and they could get $400 for him at the killers. I said, “it will take me about an hour to get there and I’ll give you the &^%$ $400 so you won’t be out anything! I retired him and had him for 5 years. No one ever sat on his back. After that time he was in distress and I put him down.